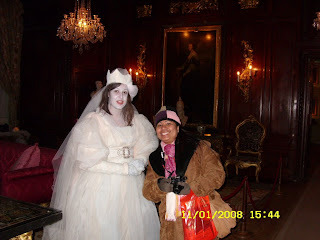 I was really thinking that this is just a wax figure..I was surpised as she spoke to us while passing the Great Room in Warwick Castle..I asked to pose a photo with her. The white lady was very friendly.. The people next to us who had a kid was shouting of fear..poor kid! he was very afraid of the white lady!! It was Halloween as we visited this Castle, no wonder she wore Halloween custom! !